It’s the next best thing! If you can’t make it for Revive ’15: Women Teaching Women, Revive Our Hearts is pleased to offer a LIVE stream. Make a date with us on September 25–26 . . . it’s absolutely free! Even though it hurts . . . it's not necessarily bad to be knocked off a pedestal (or a platform) now and again. A small dose of humility never goes to waste! A tumble can help those of us who teach be real and relatable to listeners. My most horrifying downfall came when I forgot to turn off the wireless mic while slipping off to the restroom. Hey everybody, did you hear that flush? Trillia Newbell tells of a time when she mispronounced theologian J. Gresham Machen's name after rounds of practice. That one misstep made her talk refreshing to a young woman in the audience who spoke to her afterward. Apparently, my friend Trillia isn't the only one who stumbles over Machen's name. In case you're wondering . . . "The first syllable is pronounced like May, the name of the month. In the second syllable, the ch is as in chin, with e as in pen: may'chen. In Gresham, the h is silent: gres'am" (Literary Digest). I asked Revive '15: Women Teaching Women Pre-Conference speakers Trillia Newbell and Paula Hendricks to share their insider tips so we can be better equipped in proclaiming gospel truth for the glory of Christ. I don't speak on something I haven't experienced or researched well. It's that simple. For example, I won't speak about raising teenagers because my children are young, but I wouldn't mind being on a panel with older women who could speak to that topic. I ask what the purpose of their event is and if there's a topic they want me to cover. Then I open my Speaking Engagements folder on my computer to see if there's anything I've already written or taught that I can repurpose. No need to reinvent the wheel! I ask the Lord to fill me with His Spirit and give me wisdom as I read His Word—I don't want to make things up when I speak. I'd like to truthfully speak from His Word. I ask the Lord to help me be self-forgetful so I can serve well without thinking much about myself. I ask that those who hear have ears to hear what He might have for them, and if there's anything I say that wouldn't be helpful, that those words would be tossed from their minds. One can never pray enough! The power of prayer is phenomenal. When I recently spoke in Brazil, there were literally thousands of people praying around the world. I'm convinced the fruit that continues to come out of that week is a direct result. I'd recommend setting up a prayer team. I email mine before and after an event to be sure I have prayer covering. Get someone to listen to you who would be willing to tell you hard things. I have a friend and colleague who regularly critiques my talks. It has been the most helpful thing I've done in a long time. He's a trusted scholar, which definitely helps, but he's also not afraid to tell me the truth. Finally, he not only wants me to do well; he wants those who hear me to be served. It's a blessing! Consider every opportunity to speak as vital practice and preparation. No opportunity is too small: making an announcement, emceeing a wedding reception, or hosting a small group. See if it can be recorded. Then, when you're done, ask other great communicators to critique you. It's scary, but invaluable. Even as painful as it is, listen to your talks or watch the videos so you can see and hear what you are saying/doing. Have a clear goal for each message. I wrote my messages out word for word at first, but now after a few years, I can do an outline on some talks. You can't be anyone else! Don't try to mimic someone; be you. Don't try to be an entertainer. If you're a teacher—teach. I will never forget my college speech professor telling our class that everyone gets nervous right before they speak. The key is to channel that nervousness into . . . energy! 2. Keep your priorities straight. Don't ever forfeit time with God for ministry. 3. Take your thoughts captive. Something I've learned is to take the thoughts captive that inevitably come: I'm not ready. I'm not adequate. They have the wrong girl. If God brought this speaking engagement my way, He must think I'm the woman for the job. Praise Him; His strength really is made perfect in our weakness! I read over the talks and pray. I pray a lot. I feel my great need for God while speaking. It's not like writing where you can edit; once it's out of your mouth, it's out there. So I pray. Where words are many, sin is close by. I want to be aware of that. I also try to chat with those I'll be speaking with (in the crowd). I want to be their friend, if even for that moment. I like to relate with them so that when I'm up there, it's clear we are in this together. I wake up early—even though I never sleep well the night before a speaking engagement—and spend time with God, in spite of the fact that I can barely keep my eyes open. I arrive earlier than I think I need to be there, and I've yet to get there too early! There's always something unexpected to attend to. After I've spoken, I thank God. He came through . . . again! Soon after the event, I write my host(ess) a thank-you note and journal about the event. It allows me to process and learn. I also update my prayer team, then try to rest. Easier said than done after all that excitement! I bet you've learned a trick or two from your teaching experiences! 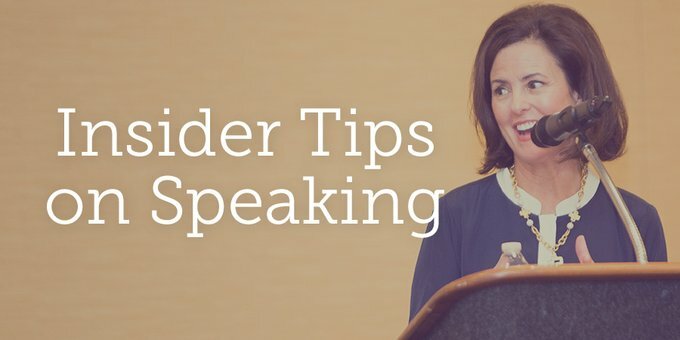 What speaking tips can you share? As each has received a gift, use it to serve one another, as good stewards of God's varied grace: whoever speaks, as one who speaks oracles of God; whoever serves, as one who serves by the strength that God supplies-in order that in everything God may be glorified through Jesus Christ. To him belong glory and dominion forever and ever. Amen (1 Peter 4:10–11). Previous Post Are You an Isolationist or a Curator?